It is now agreed by many scientists and doctors in Europe and America that our constant exposure to the electrical and magnetic fields given off by all mains wiring can disturb the health of all of us – and not just the relatively small number of extreme ‘electrical sensitives”. Because of the extremely rapid growth of the use of electricity – and the ever-increasing number of sources (radio and TV, computers, mobile phones, microwaves and radar, etc.) we are all in danger of ‘drowning’ in the electromagnetic soup we have made. Radio-frequency waves alone are now several hundred million times the level we get naturally from the sun -and which we have evolved to live with. Just as allergies often develop from over-exposure to hitherto harmless substances so, it appears, more and more of us are becoming sensitised to electromagnetic fields. Some of the highest field levels are found in bedrooms. Cables for downstairs lighting,upstairs power and lighting, the immersion heater, etc., all commonly run in the floor, walls and ceiling of the bedroom. A fact that surprises many people is that cables radiate electrical fields even when everything is switched off. – the bedroom often has even more electrical apparatus than the kitchen. – most people spend more time in the bedroom than any other single place. interference-free sending and reception of complex electrical messages. The bed we sleep in is literally surrounded by a cage of electrical and electromagnetic radiation. Because we use Alternating Current (AC) as our source of energy, this continually flows through the wiring in our homes and buildings and this creates these harmful electrical fields, even when everything is switched off. We generally sleep on mattresses which are full of metal springs which collect and radiate this negative energy into our bodies whilst we rest. Sleep is the time when our body repairs itself and if the body is subjected to electrical and electromagnetic stress during this time, the immune system is suppressed and prevented from carrying out its natural repair process fully. Demand Switches work quite simply by shutting off the electricity at the fuse box, or meter. For example, fitted to the lighting circuit, when the last light is switched off at night (or during the day in daylight hours), the Demand Switch shuts off the electricity to the lighting circuit at the fuse box. Therefore, there is no current passing through the wiring and therefore no electrical radiation given off either. Fitted to a socket circuit however, the socket itself must be switched off otherwise a ‘demand’ remains on the circuit. Simple, yet 100% effective protection from electrical fields given off by the lighting circuit whilst we sleep, allowing the body to repair itself naturally. However, when the light switch is operated, electricity is restored to the circuit and the light operates as normal. So the easiest and most effective way of removing these unwanted fields from our bedrooms in most cases is to use Demand Switches – and these are described below. NT 16-plus: nominal rating 16A, maximum 18A. Recommended for lighting circuits. NT 20-plus: nominal rating 20A, maximum 34A. Recommended for ring mains and other domestic power circuits. Action. The NT Demand Switch is installed in modern DIN distribution boards or next to older fuse boxes and is wired into the Line of the circuit to be protected (see wiring diagram below). When there is no load on the circuit, that is, when everything is switched off, (including sockets if using the NT20) the NT Demand Switch automatically disconnects the Line at the fuse box. It can sense (by use of a biologicallv neutral 4-volt DC current) the moment any switch in the circuit is turned on and instantly restores power. There is therefore no danger of being “left in the dark” at night. (a) To unprotected areas – fridges, boilers, etc. Mounting (for non-DIN boards): optional bracket supplied (with screws and wall plugs) together with terminal cover. Protection : the device is protected against interference from external inductive fields. It will not produce any stray fields itself. 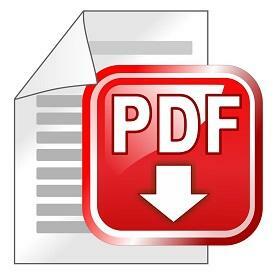 Safety : the device meets all relevant EC standards. 4 second intervals (load 2,200 watts). Full installation and operating instructions are supplied. The NT Demand Switch can normally be installed in 30 minutes or less. Demand Switches from Gigahertz Solutions. A Demand Switch? What for? Our Demand Switch is installed in modern DIN distribution boards or next to older fuse boxes, and it is wired inline to the circuit to be protected. When there is no load on the circuit, that is, when everything is switched off on that circuit (icluding sockets if used on socket ring main), the Demand Switch automatically disconnects the line at the fuse box. When any switch or appliance in the circuit is turned on, it instantly restores power. Single-poled disconnection for optimum operator protection and minimum residual ripple. Overcoupling is optimally diverted with a low ohm output. 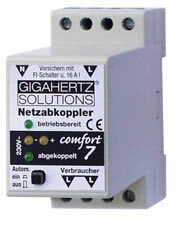 The Gigahertz Solutions Demand Switches have been installed by many experienced electrical engineering technicians for many years. They are on the recommendation lists of renowned building biologists and are in use in thousands of households every day. Using the ELF NA7 makes it possible to use house installation night-lights like inside light switches, or nighttime baby-lights. That means, when you have to pass a dark hallway at night you can still use orientation lights. Also, the ELF NA7 has a real-time protection system for high voltage protection integrated within it. These demand switches also act like lightning protectors as they are able to take out the lightning’s energy and thus protect all devices behind the demand switch. Unfortunately the demand switch itself will be destroyed in event of this happening, but it will help to protect everything behind it, suchas cables, lights, TV, computer etc.